This tune goes by a number of names including “All the Blue Bonnets are Over the Border," "Over the Border," "Blue Bonnets Jig," "Blue Bonnets," and "Scotch Come Over the Border." Samuel Bayard thinks this tune was fashioned in the 1740's into a quick dance piece in 6/8 from a slow 3/4 time song tune from about 1710 or earlier called "O Dear Mother (Minnie) What Shall I Do?" This "Blue Bonnets Over the Border" was in turn the basis for a 4/4 version called "Braes of Auchtertyre/Auchentyre," "Belles of Tipperary" and "Beaus of Albany;" out of this group of tunes came "Billy in the Lowground/Low Land." Michael Diack's, on the other hand, has written in his Scottish Country Dances that "Blue Bonnets" is derived from a 17th-century Scottish tune called "Lesley's March to Scotland." If this is the "Leslie's March" printed by Oswald (1755) and Watts' Musical Miscellany (1731), then the resemblance seems obscure and based on a few motifs. The tune, correctly classified a jig, often appears under the label 'country dance tune' because of its long association with the dance. Neil's (1991) version is an adaptation of one appearing in Uilleam Ross's Collection of Pipe Music (1869), and the piece is said to be a quickstep march of the Black Watch. 'Blue bonnets' is a euphemism for the Scots, stemming from the custom of Jacobite troops to identify themselves with a white cockade worn on a blue bonnet. 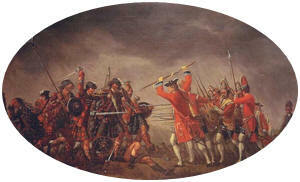 The white cockade emblem is said to have originated when Bonnie Prince Charlie plucked a wild rose and pinned it to his hat. 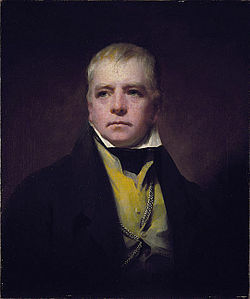 Lyrics to the tune were written by Sir Walter Scott, who based them on an old Cavalier song (Scott also mentions the song in his novel The Monastery).